We sometimes take our kitchens for granted. They are much more than just rooms in which food is prepared. They serve as the centers of the home, places of warmth figuratively as well as literally. My kitchen is like my life—colorful, messy, and full of projects in various stages of preparation! 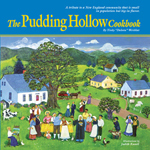 Historic New England has dubbed 2009 the Year of the Kitchen and has put out a wonderful book America’s Kitchens (of which I’ll write more soon!). I hope to follow its lead, not just by going to some of the events it has scheduled to celebrate this special year, but also by writing about the kitchens of neighbors and readers. 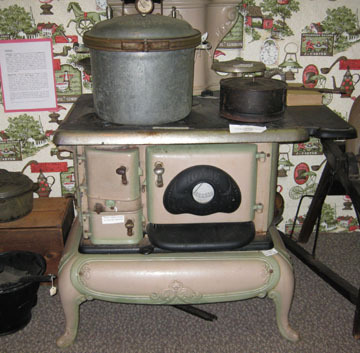 My first personal Year of the Kitchen event took place recently in East Brunswick, New Jersey, where I observed food historian Susan Luczu give a talk called “A Taste of the Hearth” at the East Brunswick Museum. Susan lives in an early-18th-century house near the museum. She collects historic kitchen equipment, which she uses to cook authentic, tasty foods in her house’s huge original fireplace. Susan brought several of her treasures and several of her foods to share with museum visitors. 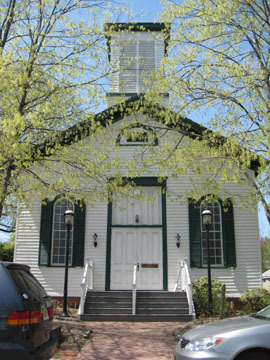 The East Brunswick Museum is a tiny jewel located in a 19th century church in the historic village of Old Bridge. It is celebrating its own Year of the Kitchen with an ongoing exhibition called “What’s Cooking” that features kitchen tools and accessories. Some are part of the museum’s permanent collection while others are on loan from supporters like Susan. Susan began with a bit of background about her interest in culinary history. 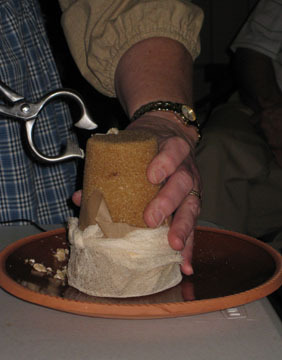 She then showed off a number of the 18th-century kitchen tools and utensils she has collected over the years, which ranged from heavy pots to a portable toaster. “People back in that period were pretty sophisticated in their cooking,” she said of our colonial forebears. Susan is almost as inventive as the 18th-century cooks she studies. 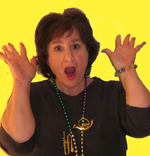 She described how she had recreated some of her props. One of these was a sugar cone; she explained that people in the 1700s bought and stored sugar in cones and showed us how to extract a little sugar at a time using her antique sugar nipper (it looked a bit like pliers). Another homemade tool was a corn pot-scrubber for cleaning cast-iron pots, which she made from a whisk broom. Naturally, Susan concluded her talk with a lavish tasting. She was nice enough to share her recipes with her audience so I can pass one of them on to you. 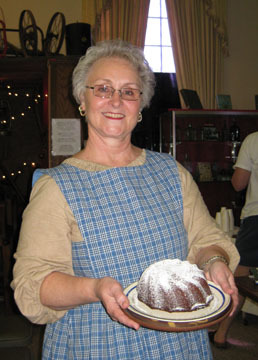 Susan’s next presentation at the Museum in East Brunswick New Jersey will be a Victorian Tea Day on Sunday, May 17. The Museum asks participants to reserve seats in advance; here is the web page with contact information. (Attendees are encouraged to dress in garden-party finery.) I highly recommend this event: Susan is knowledgeable, smart, funny, and down to earth. New Englanders looking for a Year of the Kitchen event may want to attend the Spring Herb Sale this weekend at the Lyman Estate Greenhouses in Waltham, Massachusetts, or take the tour “A Tale of Two Kitchens” in Portsmouth, New Hampshire on Saturday, May 9. Information about both of these events is available on Historic New England’s Events Calendar. 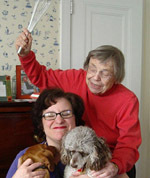 To learn more about Susan, visit her web site. I’ll be looking for more kitchen events to write about soon. Meanwhile, here is one of Susan Luczu’s recipes. She baked this gingerbread in a lovely Turk’s Head mold. Preheat the oven to 350 degrees. Grease a 9-inch round cake pan or a small (4-cup) cake mold. Sift together the flour, baking powder, soda, and spices. Set aside. Cream the butter until it is fluffy. Add the brown sugar and beat well. Add the egg and molasses, and beat for 1 minute more. Gently add the flour mixture, alternating with the water. Stir (or mix on low speed) until just combined. Pour the batter into the prepared pan, and bake it until the top springs back when lightly pressed with a finger—or until a cake tester comes out clean (35 to 45 minutes). Cool the cake for 5 minutes in the pan; then turn it out onto a plate and let it cool completely. Sprinkle the top with powdered sugar. Serve the cake warm or cold with vanilla sauce, lemon curd, or butter. Serves 8.